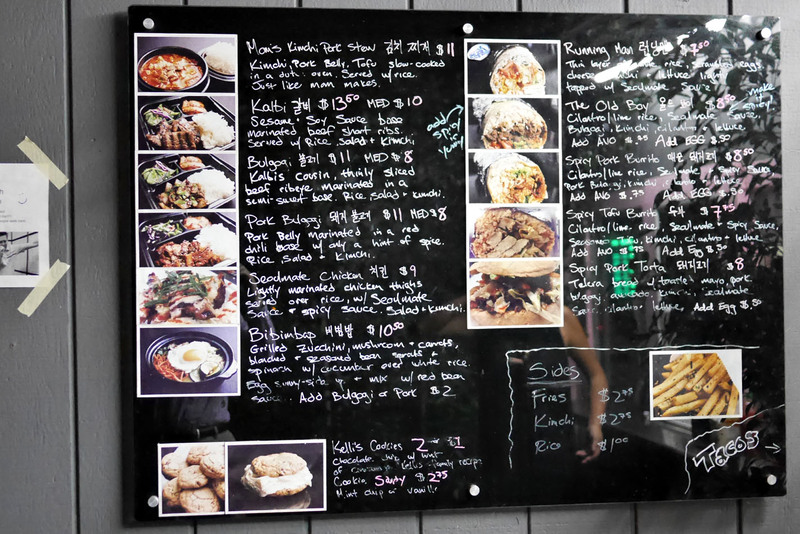 From what I've read, Seoulmate is only the second Korean restaurant ever in Long Beach (after Sura in Downtown), which I found surprising given the sheer size of the City. The place isn't purely Korean though, and has its share of fusion-y elements as evinced by the punny name. 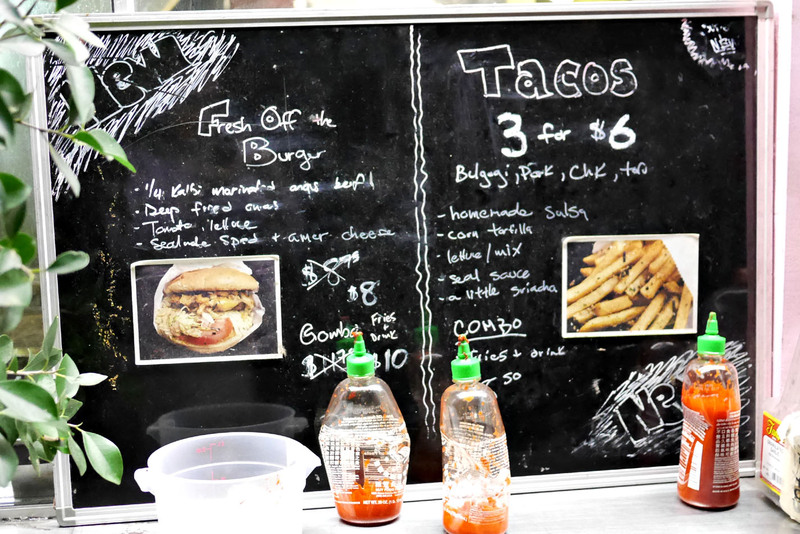 It's the work of owner Jason Kang, a 29 year-old originally hailing from Valley Cottage, New York. He graduated from Nyack High School and moved out west for college, attending Cal State Fullerton. 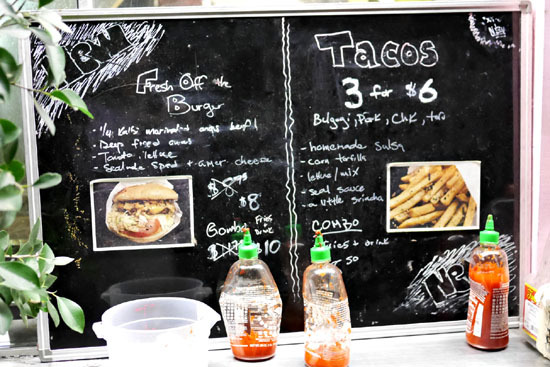 After dabbling in the film and finance industries, he decided to get into the food biz, and thus debuted Seoulmate in November 2013 with Chef and Santa Ana native Michael Martinez at the helm. 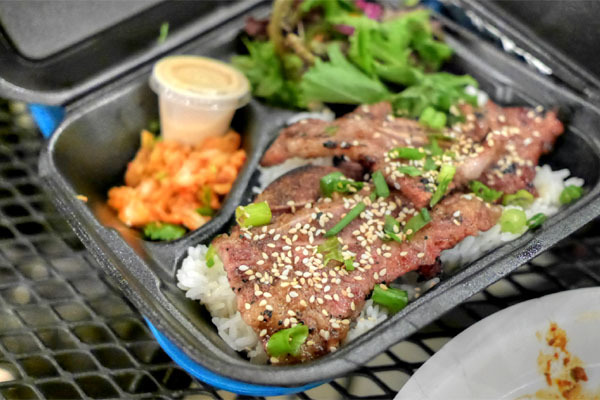 Seoulmate takes over the old Mosher's Gourmet spot and is strictly a counter-service type of joint. As for the menu, you get O.G. 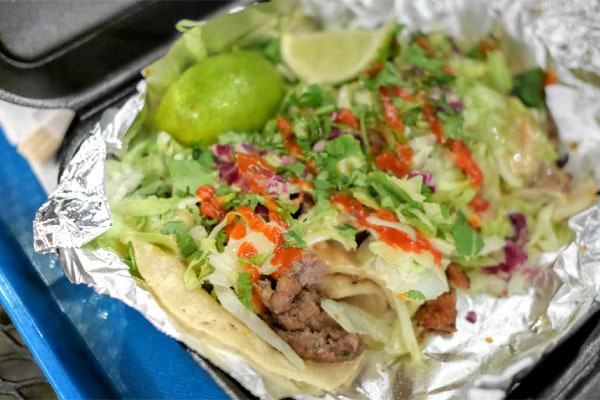 Korean dishes such as kimchi jjigae and bibimbap as well as more Kogi-esque items in the form of burritos, tacos, and such. Click for larger versions. We began with what's probably the restaurant's most popular item. 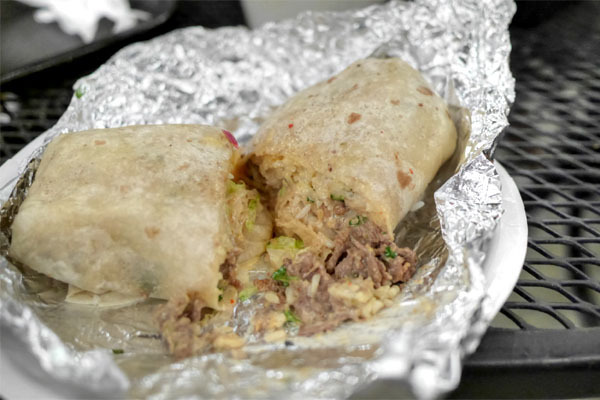 It's a bulgogi burrito basically, and quite a good one at that. I definitely tasted the sweet savor of the meat, joined by notes of sesame, a slight heat, herbiness, and a great kimchi tang. Well integrated. 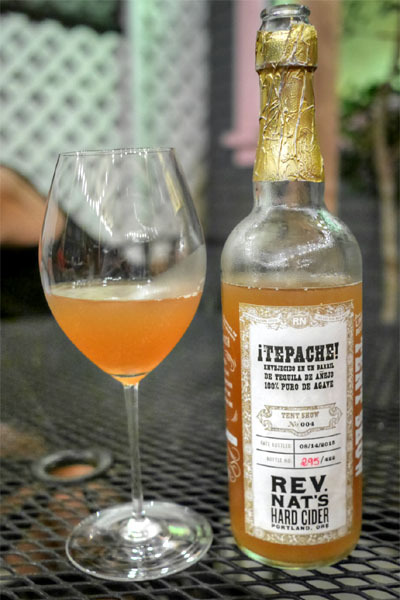 The food here screams for booze so we BYOB'd it, starting with the 2015 Reverend Nat's Tequila Barrel Aged Tepache, a reposado barrel-aged pineapple cider with piloncillo and spices, one of only 422 bottles produced. I'd had the regular version at Knuckle & Claw a while back, but this was definitely on another level. I got loads of acid and funk on the nose, and in terms of taste, massive amount of boozy tequila, oak, and acidity, all over a base of tropical pineapple sweetness. A note on glassware: I was in a fancy mood tonight and brought along a stem from my Riedel Sommeliers collection (hand-made, mouth-blown leaded crystal from Austria), specifically the Hermitage glass, typically used for Syrah. I doubt that it had too much effect on the actual taste of the beer (it probably concentrated the aromas a bit), but it certainly felt like more of an occasion. 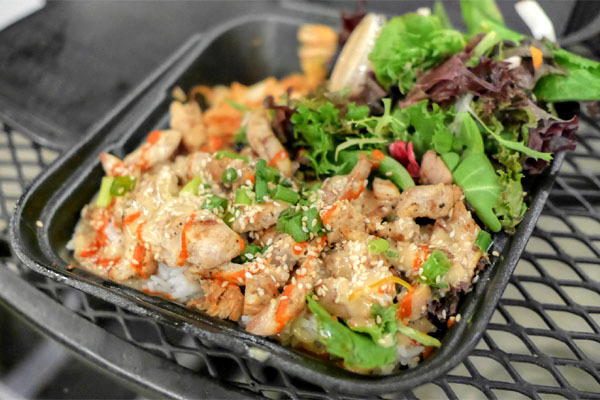 Seoulmate Chicken [$9.00] | lightly marinated chicken thighs served over rice, w/ seoulmate sauce + spicy sauce. salad + kimchi. An unassuming chicken dish was as easy to eat as it appeared, the reasonably tender, flavorful bird certainly making sense with the sesame and spice notes abound. 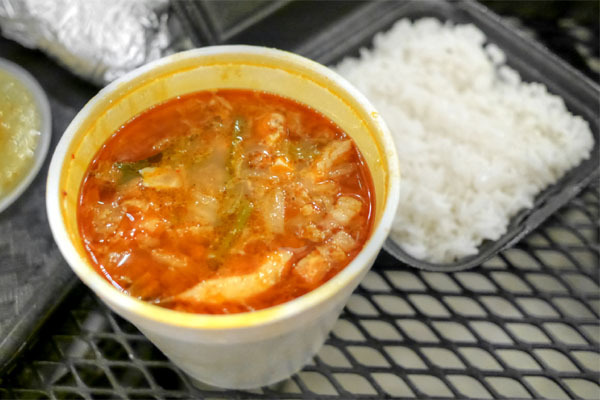 Mom's Kimchi Pork Stew [$11.00] | kimchi, pork belly, tofu slow-cooked in a dutch oven. served w/ rice. just like mom makes. Kimchi jjigae was serviceable and went well over rice, though it could've used more funk, more heat, more depth. 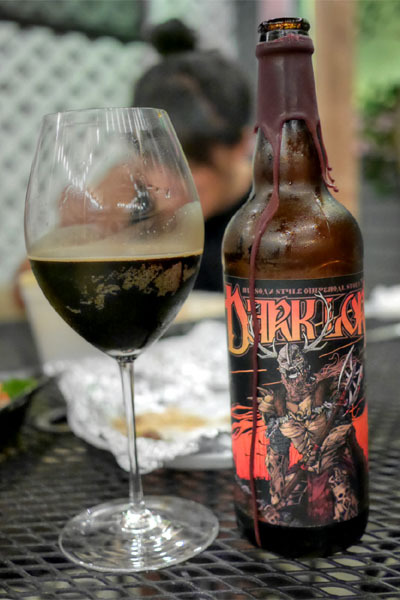 Next was the 2015 3 Floyds Dark Lord, a Russian imperial stout brewed with Dark Matter coffee, Mexican vanilla, and Indian sugar. Available at the brewery on only one day a year in April, it's one of the most iconic beers of our time, and was a pleasure to drink this evening. The aroma contained near-ridiculous amount of cocoa powder and the taste followed, giving up immense notes of rich chocolate and sugary malt, tinged by a trace of coffee-esque astringency. A lot of people complain that Dark Lord's overly sweet; it certainly is sweet, but I've never found it to be overbearing. 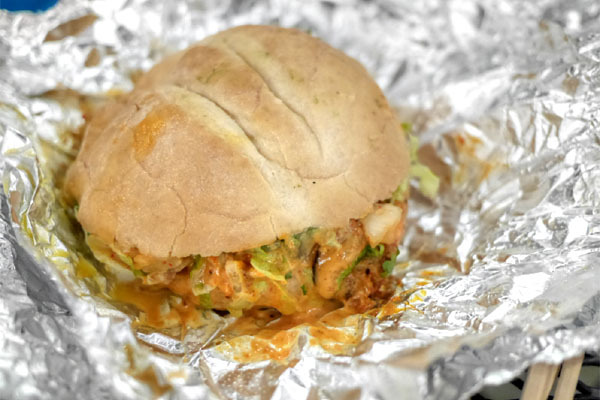 This take on a torta was one of the weaker courses of the night. 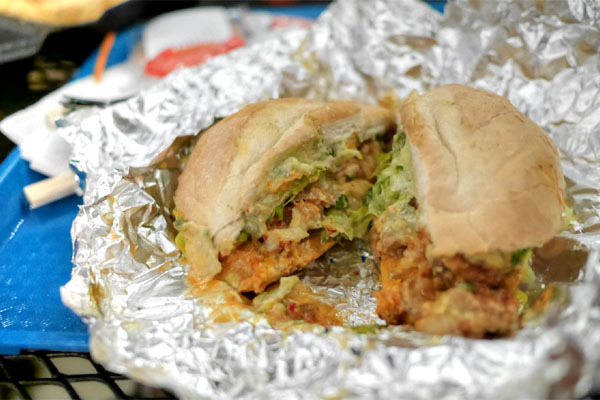 The spiciness of the pork was definitely present, but the sandwich just seem a bit muddled. Texturally, the roll was on the soft, soggy side, and could've been crustier. 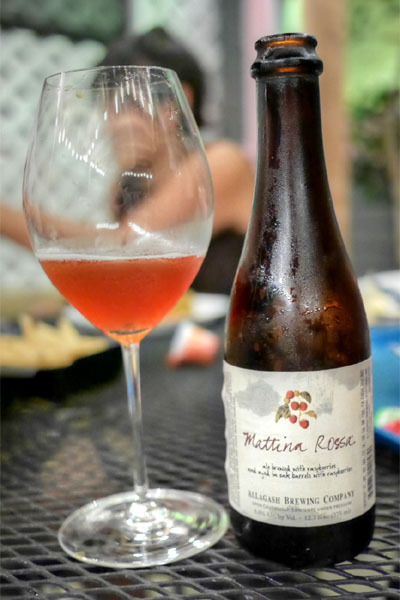 Our first sour was the 2015 Allagash Mattina Rossa, an ale brewed with raspberries and aged in oak red wine barrels. It turned out to be one of the better raspberry beers I've had: nose of super tart fruit leading to flavors of intensely bright, rich, acidic berry with just the right amount of funk and yeastiness thrown in. 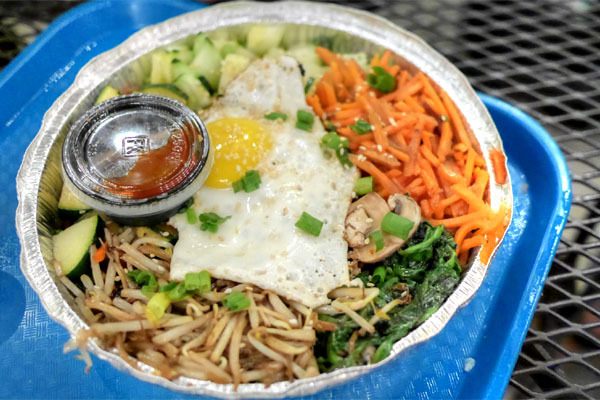 Bibimbap [$10.50] | grilled zucchini, mushroom + carrots, blanched + seasoned bean sprouts spinach w/ cucumber over white rice. egg sunny side up + mix w/ red bean sauce. Given my penchant for bibimbap, I had to get this. It was pretty classic, with sesame and spice commingling with a variety of tastes and textures from the veggies, the egg adding a tad more luxuriousness to things. Even better with a dollop of gochujang, though I do miss my usual dolsot treatment and its resultant nurungji (it's hard to get that scorch when the rice is served in a container usually reserved for chili-cheese fries). 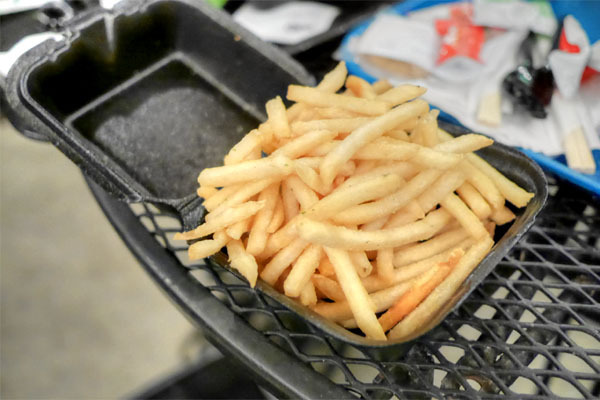 Fries were almost Jack in the Box-esque, but with more aggressive spicing. 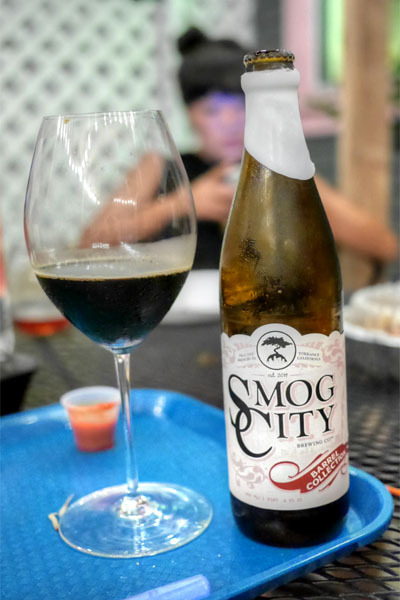 A bottle that'd been on my to-drink list for a while was the 2015 Smog City Infinite Wishes, which was The Nothing (their standard imperial stout) aged in bourbon barrels for a year. 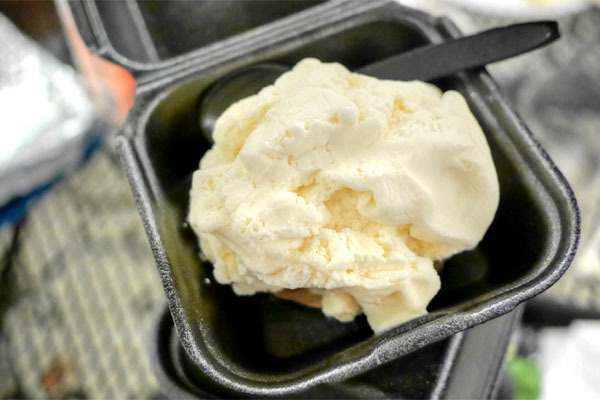 Smelled of large quantities of brown sugar mixed with a boozy tartness. Tasted of persistent dark fruit and chocolate, with more of that bourbon-y heat lingering long and strong. Tacos were tasty enough: a spicy-yet-creamy pork; a sweet bulgogi with a nice touch of herbiness; and a pleasantly charred chicken. 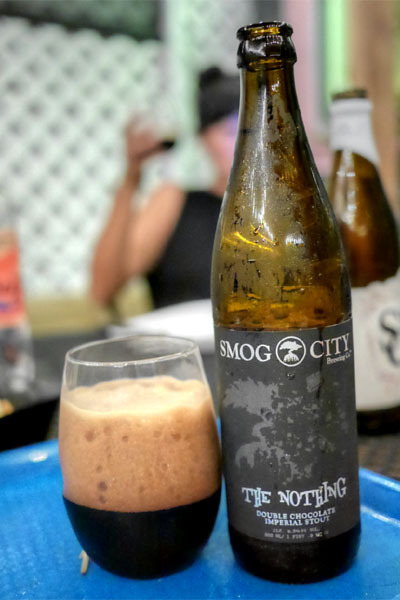 And here we have the 2014 Smog City The Nothing, the base beer for the Infinite Wishes above. It was a double chocolate imperial stout made with chocolate malt and two types of cacao nibs. I found the beer tasty in its own right, thinner of course, but also spicier, smoother, with more pronounced chocolate-y flavors in place of barrel character. Of course we had to sample good ol' galbi too. It was a pretty textbook preparation: sweet, somewhat chewy, a touch charred, and reminiscent of what my friends used to cook up on the backyard grill. 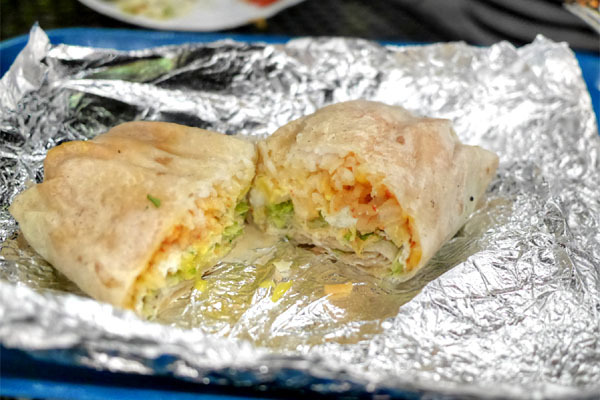 Seoulmate's take on the breakfast burrito was promising, with an appealing balance of egg and kimchi front and center. What would take this to another level, though, would be to fold in some spicy samgyeopsal or similar. The second sour of the night was the Mikkeller Blå Spøgelse Blueberry Bluebic, a collabo with 3 Floyds. 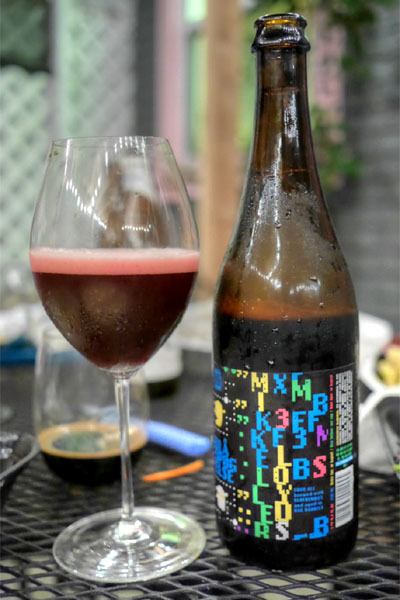 I was a fan of this, getting loads of tart, acidic, almost balsamic notes in the aroma, while taste-wise, the beer went tart, earthy, with intensifying amounts of jammy fruit. Yum. 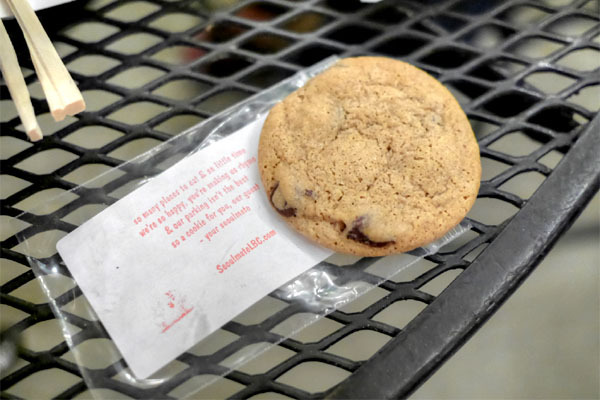 You should receive a free Kelli's Cookie with your order, along with a note apologizing for the lack of parking (which I didn't find bad at all--just go to the Starbucks lot next door). I'm not sure who Kelli is, but it was a fine cookie, classic in its chocolate chip sweetness, but with a delightful hit of cinnamon on the finish. 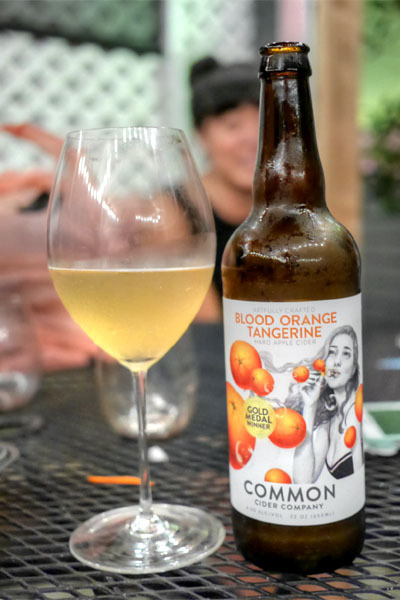 The 2015 Common Cider Blood Orange Tangerine was our final beverage, a cider blended with citrus, as the name would imply. I found this crisp, refreshing, apple-y at first, but then barnyard-y, with citrus notes overarching everything. The usual dessert at Seoulmate is an ice cream sandwich, but they were running low on cookies, so they gave us these complementary ice cream "tostadas" instead. 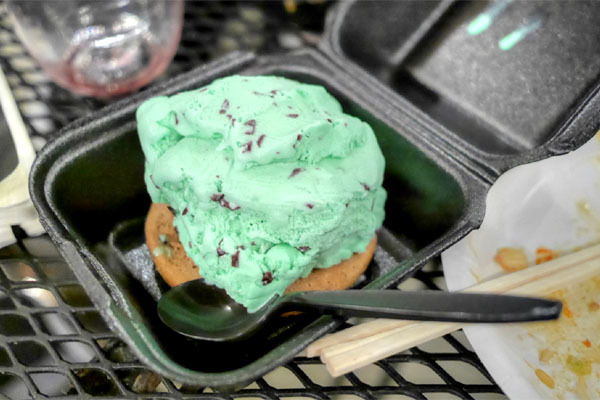 The ice cream here (mint chip and vanilla) was of the more déclassé type, but in a good way, like what came in those big tubs you got in elementary school. 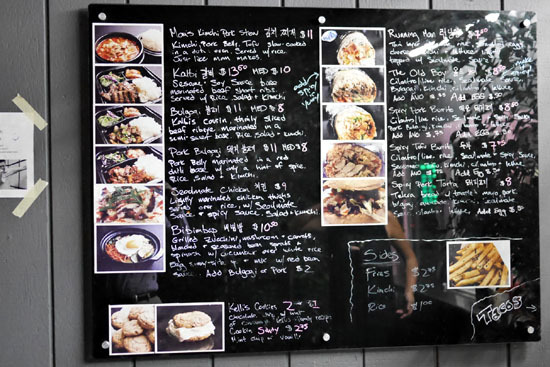 Seoulmate was pretty much exactly what I was expecting: largely tasty, satisfying, filling, cheap, somewhat trashy Korean-inspired eats in a quaint lil' location. It serves its purpose. Kevin, your beer access and selection is phenomonal. If you ever would like to do a beer trade with someone in Canada, I'd be interested!